It has been some time since I posted on some of the activities we do here in the Oh Waily household. This is one of our latest. We have been playing I Spy with Miss Oh Waily for some time now, often as a bath time game and a travel game. 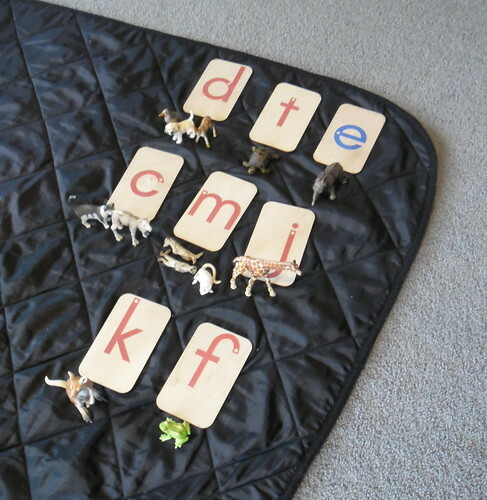 This is an extension idea that I had when I was reading Montessori Read and Write. 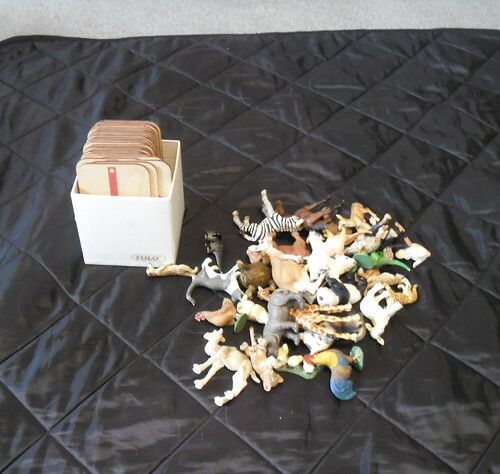 I collected all of the plastic animals together and brought out her sandpaper letters. They were piled on to the mat as our starting point. Step one was to ask her to pick an animal and tell me its name. Then I asked her what sound the animal’s name began with. Once she identified that, we sorted through the sandpaper letters until she found the one she wanted. 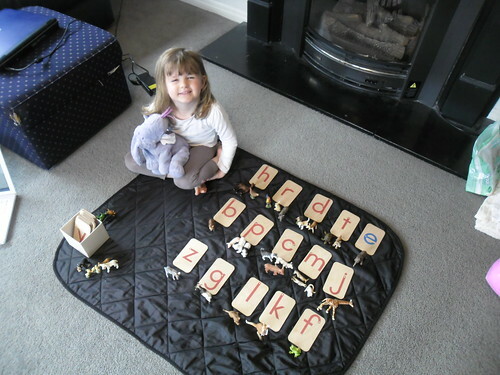 Animal and letter were then placed together on the mat. And this is the midway point of doing the activity. Once all of the animals were matched with the appropriate letters we had “families” of animals beginning with the same sound. You might notice that the giraffe is under the “j”. Well, on a sound basis this is pretty much fair enough. You may also have noticed that there is a small pile of animals set aside next to the sandpaper letter box. These are the ‘misfits’. Mostly animals who have starting sounds like “ch” or “sh”. We will deal with those in future, first I wanted to keep it simple. And that is I Spy with Animals.